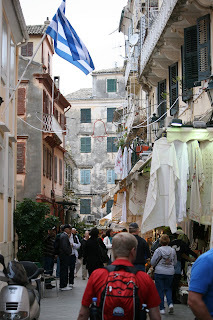 Corfu is another Grecian island located off the western coast of Greece and Albania. It is a prettier island with a lot more greenery. The houses and buildings are more of look of Venice as the building style and color is similar to Venice. First we went to a old home that was once owned by someone I can’t remember, but is now owned by the government. It was a pretty home– large for the time period, even for now, I suppose. The view was really beautiful. From there we went to the main part of town. We walked through the streets and went into one of the churches there. It was pretty interesting. After that we wandered through the streets into different shops. We stopped at a little café and had a gyros sandwich (pronounced "yee rows"). It was pretty good. There was a cute little fruitstand there. Well, actually it is a marketplace where there is a lot of stuff for sale. Interesting and fun. The streets are very narrow. We came back on the ship and Paul wanted an ice cream, so we headed upstairs. I had a little salad. Sheldon and Carma were there having a burger and a salad. Joni and Eric showed up, so we had a snack and a fun visit with all of them. We came back to the room and I started chilling and fevering. I sent Paul to dinner without me. Sheldon had some oil, so he and Paul were able to give me a blessing, which helped. We are glad to be headed home, I think. Tomorrow we will be at sea, headed back to Venice for flights home. I woke up at 6:30 am this morning. Partly from this nasty cold I started in on a few days ago. I looked out the window to see where we were at. I saw these sheer cliff walls and what looked like snow on top. As I looked closer, I noticed they were HOUSES, not snow. WOWEE! 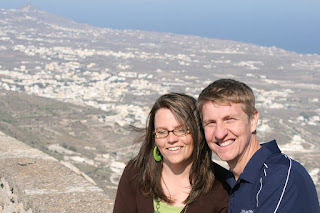 What I learned today is that Santorini is one of the Greek Islands– probably the most expensive real estate in Europe. It is actually the top edge of a volcanic crater– the center of the crater under water. 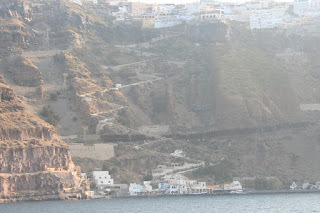 The water is so deep by the sheer cliff walls, that the ship has to anchor further away and tender boats take you from the ship to the island. There is one spot on the island where cars can come down to the shore– that is where they took us. On the way home, you can either take a cable car (like a ski lift), ride the donkeys, or walk down the steps leading down the cliff walls. 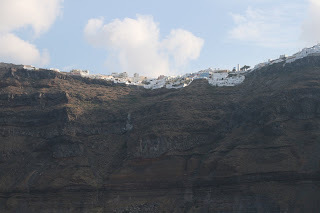 The towns on Santorini are built on top of the cliffs or crater top. It is all volcanic soil–lava rock, pumice stone, etc. There is hardly anything green growing due to lack of water. They catch water in cisterns during the rainy months and rely on the fog that settles on the city almost everyday for the moisture to soak into the pumice that holds the moisture so well. Their electricity is generated from diesel fuel generators. All their food and products are imported. They do grow grapes, tomatoes, and one other thing I can’t think of right now. The homes are built right inside the volcano wall. They just cut out some space and put a door over the front of the opening. There are quite a few homes on top that are normal homes. Almost all homes are white stucco with blue roofs. There were a few places that were a light yellow/cream color, a light peach color, and even a couple of light blue. It is 98% Greek Orthodox and 2% Roman Catholic. Almost every family builds their own church if they have the property. In the town of Profit (population 240) there are 40 churches. All churches are white with blue roofs. The blue symbolizes the sky or the place in which God lives. Their main industry is tourism, of course. The wind blows all the time. It was an interesting place. Very beautiful in some respects, but rather bland in others– with no greenery. I don’t think we saw any grass, for example. We visited the city of La which is on the tip of the island. There were some beautiful homes there and a gorgeous view. Then we went to the highest point on the island for some really pretty pictures and an amazing view of the island and those surrounding it. We stopped at a restaurant for an appetizer plate of Greek foods. Some were good, some were not so good. They had these pitchers on the table of what looked like apple or white grape juice. We were a little scared to try it. Some guy took a sip and told us it was apple juice, so Joni tried it, well, let’s just say it wasn’t and now she’s wondering if she needs to see the Bishop. ;o) From there we went to the main city of Fila. We shopped around a little bit, then took the cable car back home, joking about Joni’s drinking problem for the rest of the day. We get to sleep in in the morning as we won’t be to Corfu, Greece until noon. Our excursion is at 1:00 pm. 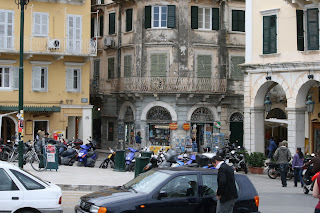 Corfu is another Grecian Island, but supposedly more green and lush. It is also a much bigger island. Should be a fun day, then it will be at sea and back home. Truthfully, I am right about to the time that I am ready to be home. I’m only good for 7 days max, so I’m starting to feel it. Especially when I read my note from Whit about Jadon chopping his finger nearly off and her having a bad glucose test. Although I don’t miss laundry and mopping too much, I sure miss my family. Today was a wonderful day. We woke up late again as our wake up call didn’t work. We got up at 8:00 am and had to be to the excursions by 9:00 am. We hurried and ran up to breakfast. The Wittwer’s, Dalton’s, and Christensen’s were all there, so that was fun. We all finished up breakfast and headed down to the buses. 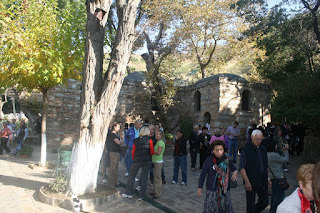 For the first part of our tour, we headed to Ephesus (correctly pronounced "eh FEH soos") (I had to think of "Festus" and " Dr. Suess"to get the sounds down) to tour the House of the Virgin Mary. This is supposedly the house where Mary, the mother of Christ lived following His death. She came here with John, the Beloved, whom Jesus said, "behold thy son....behold thy mother" to. So John took care of Mary and brought her to Ephesus. 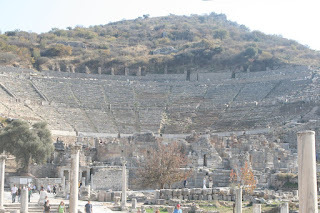 Ephesus at the time of Christ was a large city of 250,000 people and in the Roman Empire. 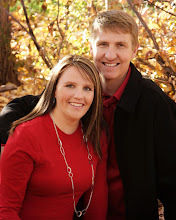 They came because the large number of people would give them a great missionary opportunity. However, they also didn’t like Christians very much, so Mary’s home is built in the hills away from Ephesus and secluded where it would be harder to find. As a matter of fact, the story goes that a nun had a dream about this house and saw Mary and knew it was her house and where it was located. The nun lived in England or something, so she never visited, but her story was written in a book and years later someone who had read the book traveled and began looking and found this place in the exact detail as given in the book. Earthquakes and time have destroyed much of the home, but a lot of the foundation was there, so a replica was built atop the old foundation. It was pretty interesting. I really wanted to feel the spirit there, but it is a little weird when there are candles and statues and such– more like a shrine. Sis. Dalton came up to me (she was on the other tour, but saw us there) and said, "didn’t you just feel the sweetest spirit in that place?" So then I felt really bad, so I went back through and just tried to reflect on how Mary would have felt living there after seeing her son die. That was a little better for me, but I am a reflector and often feel things after I have done them and begin to reflect. 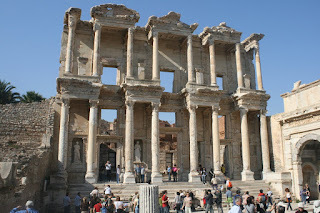 Our second stop was in the old ruins of Ephesus itself. WOW! What a place! I could have stayed there for a couple of days just wandering around there. There are so many things preserved and still being uncovered in that neat place. The library was HUGE and just Awesome! Then we got to stop in the theater (Colosseum). This is where Paul preached to the Ephesians. I stopped and sat down and read Acts 18 & 19 while there. That was REALLY cool! It was interesting trying to imagine Paul preaching to the vast number of people who were so wicked and idolatrous. They had many Gods. The one they loved in Ephesus was Artemis (or Diana, the goddess of fertility). There were a lot of statues there because of their worship of Gods. The Theater holds 24,000 people. WOW! For back in that time, huh??!! I couldn’t help but think of the Conference Center... I just loved this place. 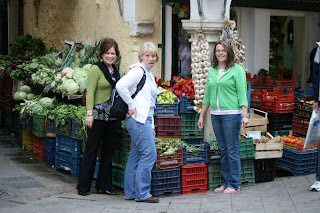 After Ephesus, we went to lunch in a little town called Sirnce (pronounced SHA rench JAY) or something like that. It was a cute little place in the hills where they grown olives, peaches, grapes, and such. Turkey is also one of the biggest producers of figs. We had a salad that was different from ours, some olives, and eggplant something, and some really good bread for appetizers. The lunch was a lamb kabob, a chicken kabob, and couple of Turkish meatballs, some rice and french fries. For dessert they served melon and Baklava– which was really good and very rich. We were told that Baklava originated in Turkey and the Greeks stole it– kind of funny. Our guide said, "how could this be Greek? Only we produce pistachios and hazelnuts. We are the largest exporter of hazelnuts. The Greeks don’t even have them." Then she said she couldn’t talk for a minute because she was mad. She was laughing and so were we. Oh, the country rivalries. We did mention that we liked Memot Okur, just so we could get in good with the locals. A couple of people told Brian Paxman (who runs the blimp at the Jazz games) to tell Memot "hi" for them. Yep, you bet– the next time we see him, huh?? Funny! After lunch, we visited St. John’s Basillica. This is the ruins of an old church that they said John the Beloved died at, but they could not find his body. (Go figure– he’s still around according to our scriptures, huh? AND if you go see Forgotten Carols......) Well, it was a neat place. She said that the "legend" is that John was visiting with God and He told him that he would not be here for much longer, so John dug a hold and laid in it until he died. A few days later, some apostles found the hole and a smell, but did not find John. There were supposedly some caskets uncovered, but I didn’t hear the date as I was contemplating that he was translated, so I’ll have to check Sheldon Wittwer’s notes on that and update later. Anyway, the ruins were still pretty cool and they looked out toward the old city of Ephesus and toward the hill where the House of the Virgin Mary is, and also toward the Mediterranean Sea. After this stop, we went back to Kusadasi (pronounced "Koosh A dawsee") and went to a store where they make carpets. We watched how they grow the silk worms, then kill them, then spin the silk. There is one mile of silk in each cocoon. He showed us the various natural dyes that they use to color with. I was pretty tickled to see our good old red root among them, as well as saffron, indigo, daffodils, and even rock salt. Then we saw the lady who was tying knots and creating a rug. WOW! What a process. We could have bought a rug really "cheap." You know, they are on sale since we are one of the last boats of the season and they are trying to get rid of stock. One couple bought a 4x6 rug for $1,100 and they threw in three purses, too. Yep, we have to get blinds first. But it was fun to know that Turkey is the capital of the world for handmade rugs. Pretty neat. Now we are back. Paul is up on deck getting photos of the port and eating ice cream. He hasn’t come back since I started typing, so I assume he found someone to visit with. We will go to the show at 8:15 pm, then to our 9:00 dinner. Today we were at sea so it was one of those sleep-in relaxing days. We actually didn’t wake up until 9:30 am and had to race to get to breakfast. After breakfast, we came back to the room. Paul started to read and fell asleep for a couple of hours. I started typing–working on my book and on the blog. About 2:00 pm, I finally woke Paul up. We called the Wittwer’s and met them on Deck 9 for a round of miniature golf. We were laughing so hard Paul couldn’t quit crying. Of course, I have mini-golfed about twice in my life, so I was taking several strokes per hole. About hole four I started to show some improvement and Sheldon complimented me about my improvement for having never played. The next hole, Paul and Sheldon were saying that we needed to hit it a little harder, so I did and banked the ball off the wall for a hole in one. It got a lot funnier from there. We had balls jump a few of the greens for a great set up two holes later. Paul actually got a hole in one, then about 15 strokes on the next hole. Needless to say, we were laughing pretty hard by the time we got done. One of those "guess you had to be there" moments. 1. Say your morning and evening prayers everyday. 2. Read from the scriptures for 5 minutes everyday. She talked about the youth and the great strength that they have. We visited about Costa Rica and had such a neat discussion with all of them. The Christensen’s (Joni & Eric from St. George) came walking up and they sat down and shared with us, too. 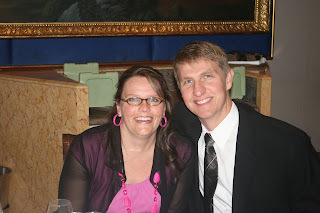 They told us about their experience and call as missionaries as a young couple with two kids. Then she got pregnant just after they entered the mission field. They served in Adam-ondi-ahman. It was a really neat story– and funny, too, when she told about wearing a Missionary Badge and being pregnant– all the looks and the stares and stories. Pretty funny!! She said her brother told his wife on their first date that his sister got pregnant by another missionary. Isn’t that a crack up??!! Anyway, it ended up being a really spiritual and neat evening. I was pretty tired, so I crashed. The waters started getting rough while we were on deck and it was a little rocky all night. I woke up in the middle of the night listening to the wind and feeling the rocking. I had to peek out the window just for fun. It was a great and relaxing day. We didn’t get to bed until midnight last night. We have the late dinner–9:00 pm. Following dinner, we found Dan & Dusty Hawk as well as several other friends. Paul sat and chatted with Dan and Dusty for a while–just laughing his head off at them and reminiscing. After dinner I came back and wrote about our day– thus the late night. Paul found a football game on and watched it, but I didn’t know that until today– I was out cold! I slept like a log and when I woke up, I noticed the sun was up and so was Paul. I looked at him and asked what time it was– 9:30!!! I jumped out of bed and raced to get ready as our tour started at 10:30 am. 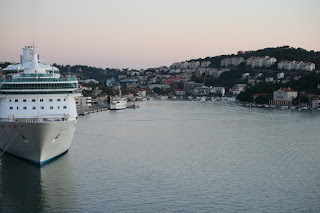 When we got up on deck, I was blown away by the beautiful port we were in. 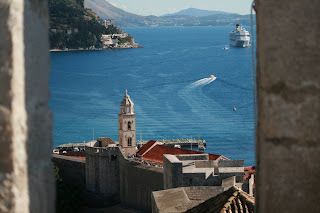 Dubrovnik is a city built in the hills in the bay of the ocean. The port was surrounded by these beautiful mountains and an giant bridge off to the side of the ship. It was such a clean and beautiful looking town. 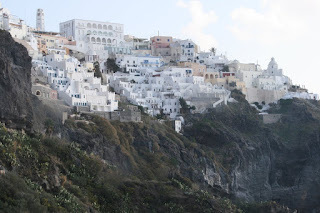 All the buildings seemed a white/cream color with orange roofs–very clean and neat. 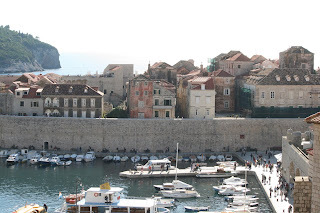 As we boarded our bus for the tour, we were taken into the old part of Dubrovnik– the city walls. This wall was built hundreds of years ago as a protection to the city. There are houses and churches inside the walls which used to be the town. The homes, businesses and churches are still occupied today and is a very bustling place. 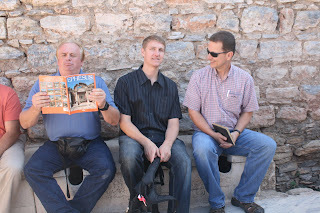 While walking the walls of the fortress, we were able to listen and talk to our guide a lot. Just as we entered the old town fort, there was a map that showed all of the destruction caused from the war that started in 1991. I asked her a lot of questions about the war. She was there during the outbreak and you could feel the pain of it in her eyes still. I knew it was important for me to understand what had happened here. She told of them going to the bomb shelters and living there for 5 or 6 days with no food, water, or power. The Bosnia-Serbian border is just miles away and the military had placed forces on the hill just above the fort while the ships in the harbor were firing on them as well. They were also being fired on from the air. The ships were blocking any humanitarian aid from getting through until finally (after five days) a Jewish group from Zagreb (the capital city) was able to get past the ships. However, all packages were gone through to take out newspapers and batteries for radios so they could keep their communication cut of and keep them in fear. It was so interesting to hear from someone who lived through it what it was like. It was hard for her to talk about it much because it is still very vivid. We also learned a lot about the history of the country. It was very interesting. Tourism is 85% of the economy in Dubrovnik, so they are very hopeful that our new president will help things out in America. (I told her that we weren’t too sure about that.) She said, "don’t tell me that! We depend on America." WOW! Do you realize how blessed we are and how the rest of the world really does depend on us in so many different ways??!! It was a big lesson for me. I was very touched by these people who have lived through a war. It made me wonder if they were the ones who, in the pre-existence, chose a "hard mission." Makes my life appear much easier. So today I am very grateful. Grateful for a good country in spite of its troubles and grateful to live where I live and for the gospel in my life! You will love the fact that part of our tour was a "taste of the country." 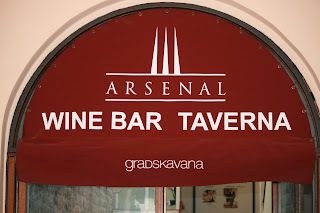 Our taste was at the "Wine and Bar Tavern" inside the old city. Paul and I thought, "this will be great to tell everyone that we attended the Wine Bar Tavern on Sunday." You’ll be glad to know we didn’t sample the wine, but got to taste some bread and cold cut appetizers and had a cute bottle of orange Fanta and some bottled water. Upon returning to the ship, we took some pictures of the port, had a snack, then came to the room so I could work on this post. We read our scriptures and I started to fall asleep, so I had a cat nap. Then we got dressed and headed to dinner. We had dinner with Dan & Dusty, the Wittwer’s, Brian and Jen Paxman, and Spencer Egan. We had an enjoyable time. The entertainment tonight at 11:15 pm was an Elton John impersonator. He was good and it was fun to sing along with the fun songs that we know! We just called the kids and got a little bit of an update. It appears Kallan and Britton lost. Kameron is still in– playing in the championships next Saturday. Jadon went up to State volleyball. He sang the National Anthem for the State game. Ticked that I missed that one!!! He said that Snow Canyon won state for a 3rd year in a row beating Dixie again (for the 3rd year in a row.) Mykelle said her team lost so they are headed to Arizona tomorrow for a Tuesday play-in game. Jadon said the primary program went well, but didn’t give details, so I’ll have to get filled in on that later. It costs us 40 cents a minute for the internet. We used Amanda’s SKYPE to call home. Just isn’t very cheap, but glad to hear voices and get back in touch. Tomorrow we are at sea all day. Tuesday we will be in Kusadasi (Ephesus) Turkey. We left Las Vegas at 8:00 am our time on Friday. We flew to New York and had a 4 hour layover before leaving for Venice. 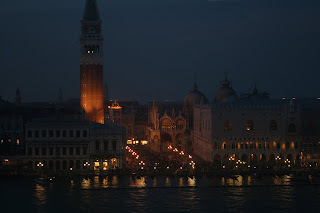 We arrived in Venice at 9:30 am (Venice Time) which is 1:30 am our time. We boarded the buses and were driven to the ship dock. 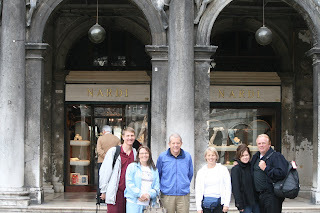 We got our room keys, put our stuff in the Conference Room, then headed out to see Venice. We were with Sheldon & Carma Wittwer, Eric & Joni Christensen, Elaine & Steve Dalton, and Bob & Stacy from Boise. We took a water taxi from the docks to San Marco Plaza in Venice. We walked up to the plaza and looked through the shops. We then exchanged some money for Euros so we could ride the Gondolas. 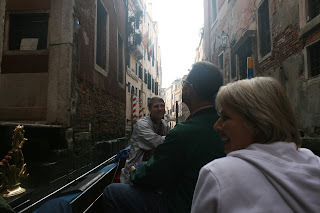 Six of us took a Gondola ride for a half an hour through Venice. It was so fun. The houses are very old, but it is a very clean city. There are little barnacles attached to the block near the water line. After our lovely Gondola ride, we raced back to the plaza to get some pizza and get a couple of gifts. We found a cute little shop and grabbed a little individual pizza. It was good. We then had to hurry back to catch the water taxi. We taxied back to the ship, got all loaded, participated in the Emergency Drill, then went to the top deck to get some photos of the city as we left port and sailed past. It was really pretty. After standing on the top deck for a half and hour or so, we were freezing, so we came back and showered, then went to the evening show and to dinner. We’ve had a really fun day–a couple of hours in Venice and reacquainting ourselves with some dear friends. We are SO tired–I’m having a hard time typing. Here are a couple of funnies, though. You know how I get sick of EVERYBODY thinking that Paul looks so young? Well, yesterday Bob asked Paul if he was Sheldon’s son. I’m cracking jokes, but actually we feel REALLY blessed. One group of 30 had to stop for a light repair and missed their connecting flights and were flown directly into Dubrovnik. There were several couples who lost their luggage. One couple REALLY lost their luggage– there was a fire in the hull of their plane and their luggage was burned. So we are feeling really blessed to be in such a great situation with a shower curtain sticking to our rears. Tomorrow’s stop is in Dubrovnik, Croatia. We are taking a tour there. Until tomorrow’s report......Ciao! A week or so ago Kameron was working on writing a story. He was at the counter writing and reading it to his dad. I could hear he and Paul talking about ideas as he wrote the story. I thought it was for his class and noticed he was taking his time and doing a good job. Last week he said, "Mom, can you help me type this story? I have to turn it in tomorrow." So I helped him type it up. The next morning he called me from the school and said, "Mom! I need you to come up and sign my story so they know I wrote it." He mentioned something about Reflections. I talked to the secretary and found out that he had, indeed, entered the Reflections competition all by himself. The other day, we got a phone call telling us that we needed to be at the Assembly on Friday morning because Kameron was getting an award. Since we were leaving, we had to send Grandma Vicki and Tiffany to take pictures. I just called home and he got a first place ribbon and gets to move on. There may have been only 6 enteries, but I am so proud of him that he did it by himself. Congrats, Kam on doing such a great job and having initiative! Okay, I'm pooped and hopefully packed. We leave at 4:00 am for our trip. We seem to be missing all kinds of things-- SEP's, a surprise for Kameron that I will report on later, football games, a choir concert, the primary program, Mykelle's playoff game. Makes me wonder why I am going......but the arrangements are all made and I'm sure they will survive even though I just found out about SEP's which means they will be out early all week. Oh great! Hope to be posting soon! Monday night we were working at the High School on the set for the play. Paul left to his ball game and I was still at the school. When I got ready to leave, I couldn't find the keys that Kameron had taken to get in the car. Kam had left the lights on inside the car, too, and I had just had a dead battery the day before. I called Paul but didn't get an answer since he was playing ball. So I went home with Jadon. Paul called on his way home and was upset because I couldn't find the keys. He stopped by the HS on his way home and there were the keys right inside the keyhole on the door. (Who'd have thought to look there??!!) So they now could bring the ar home, but Paul was faced with no driver (with a license). So he let Kallan drive the Sequoia home. OH YEAH! That's what I mean by SCARY! Paul had him do a test drive around the parking lot. Paul said he was zooming around going a little faster than he should. Kallan said he was trying to figure out the brakes. So they headed off and Kallan honks at his dad. Paul backs up and rolls down his window. Kallan says, 'Wait! I have to put my seatbelt on." Good thing it was dark and there was not a lot of traffic on the road. As Paul drove off, he told him not to forget to use his blinker. He yelled back, "what??!!! How do I do that??!!" Ohhh, the fun! Halloween Day started off with me running to Kmart at 8:00 am to pick up a shirt and pants for Kameron's costume. I dropped him off at school, then ran home to shower. I made it to the school Halloween parade just in time. I watched with Gavin, Lainee, Tara Landis, Brooke Ence, and Tiffany Newby. We had fun all there watching. I totally missed Britt, though. None of us saw him come through, so I went to his class after to get his picture. Preston was excited to go with me and see him. That afternoon I went to Kallan's class play. He did a good job. Then it was home to get ready for the evening. Kallan got all dressed up and went to a party with Weston Wilson and a bunch of kids. He looked pretty darn funny. Nola said he looked like an old man. Jadon went with Jared Radmall and Alec Bracken. They were a bunch of old women and looked pretty darn hysterical. The funny part was when they got home, their feet were aching because they were wearing Mykelle's shoes. Alec had them buckled so tight that he had a line across his ankle. Jadon was in flats and was still complaining about his feet, too. Pretty funny! The highlight of the night was the ward Trunk or Treat party. They had a big ward bash in the cul-de-sac below the post office. They had a popcorn machine up, a cotton candy machine, hot dogs and chili, a spook alley, homemade rootbeer and lots of candy. We all brought our candy dishes and handed candy out. Britton had a full bag by the time we were done. It was fun and there were a lot of people! After that, Britton went trick-or-treating with Hunter Hammer and his family. 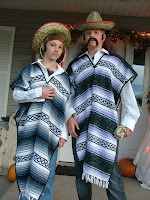 Amanda went with them so she could experience REAL trick-or-treating. Kam was pooped and came home. They ended up with a HUGE load of candy and had a great night!! Paul and I went to SLC last Saturday for Mykelle's Sophomore day. It was fun to watch her play. Jadon was supposed to sing the National Anthem, but when we got there, the guy in charge said that he didn't find out until Saturday morning and he had already booked a guy. I was thinking, "well we came all the way from St. George. This guy could drive across town again more easily." However, it was too late, so Jadon didn't get to sing. The good news is that Mykelle got to play. After the game, the girls signed autographs in the all, then we all went to dinner and came home. My computer isn't reading my picture card, so I will post the pictures later.